We have not done this Jeep trail. This description is straight from TrailDamage. One of the most fun and challenging trails in Colorado, you can keep this trail quite a bit easier if you turn around at Holy Cross City and skip Cleveland Rock. Still, French Creek is a very challenging obstacle and if you complete it the trail still has a fairly high rating. The first obstacle is the Notch. The line on the left has a crack in the rock that is fun to play in, and you can get some impressive wheelstands here. Soon after the Notch is the Slab. There is an easy bypass to the right, or you can tackle the obstacle on the left. 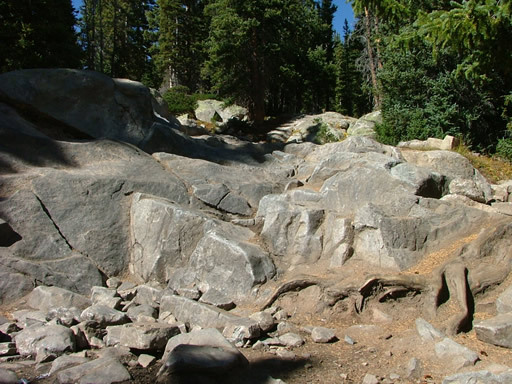 The first big obstacle is Steep Rock (formerly called "Second Obstacle"). There are many lines through this obstacle. The line on the right is the easiest as you straddle a crack, but it is still challenging. Soon after Steep Rock is French Creek, the first difficult obstacle. It changes every year, and it seems to get harder with each passing season. The line that was easiest before may no longer be the easiest one. The trail continues past French Creek and soon you come to the true Tippy Tree obstacle (formerly called "Third Obstacle"). The rock ledge is diagonal across the trail, with a big tree on the right and a drop-off on the left. You'll pass by the old mud bogs (closed and fenced off many years ago) and finally come to Holy Cross City. There is ample parking here. Many people turn around here, because the next obstacle is extreme. Cleveland Rock is just past the city, after a few rocky sections. It is big and there is no bypass. After Cleveland Rock are three smaller obstacles, Cleveland 1, Cleveland 2 and Cleveland 3. They are challenging but not nearly as difficult as Cleveland Rock or French Creek. At the end, there is an area where you can park or turn around.